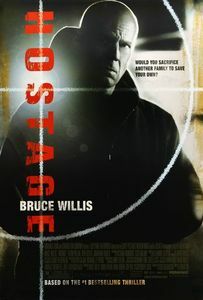 (In theaters, March 2005) There isn’t much that is remarkable in this Bruce Willis film, if not for the fact that it brings to mind about half a dozen similarly unremarkable films in Willis’ career. Bland villains, by-the-number developments, pedestrian directing, somber cinematography: Without the big-name headliner, this could have been a straight-to-video release and few would have noticed. The gritty cinematography is annoying, but not as much as the lack of involvement with the characters. Daddy is a mob accountant and the bad people are teenage hoodlums: why is it difficult to care about these people? Even Willis is more of an enigma than a hero. Oh, there are a few quirks here and there, but almost nothing here comes to the level of The Negotiator, to name another relatively recent hostage-rescue drama. Made to fill the shelves of your local video-club, this film acceptably competent, but just that and no more.